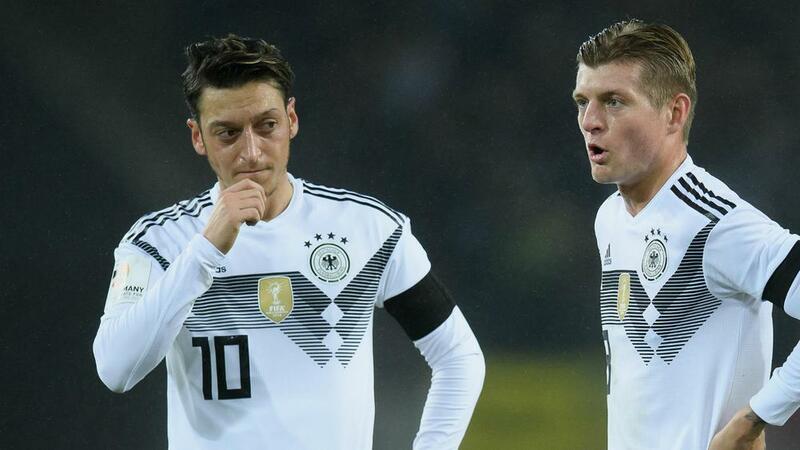 Kroos: Ozil's Racism Claims Are "Nonsense"
Toni Kroos labelled Mesut Ozil's racism allegations "nonsense" as the Germany star hit out at his former international team-mate. Ozil retired from internationals following Germany's shock World Cup group-stage exit – the playmaker growing tired of what he felt was racist treatment on behalf of the German Football Federation (DFB), supporters and even some politicians after his meeting with controversial Turkey president Recep Tayyip Erdogan. The 29-year-old Arsenal midfielder, who is of Turkish heritage, was scathing of the DFB and its president Reinhard Grindel in a lengthy statement released last month. Kroos, however, dismissed Ozil's claims of racism within the German federation prior to Real Madrid's 4-2 extra-time defeat to Atletico Madrid in Wednesday's UEFA Super Cup. "Basically, Mesut is a deserved national player and would have deserved a better exit as a footballer," Kroos told Bild. "I have played with Mesut for many years and know that he is a nice guy. "The way of his retirement was not okay. The proportion that is well and properly addressed in his statement is unfortunately overshadowed by the much higher proportion of nonsense. I think that he knows that racism does not exist within the national team and the DFB. "On the contrary, we are always committed to diversity and integration. Mesut was a good example, as many of our fellow players did. "Mesut was criticized for the photo - and rightly so. And he missed the chance to explain himself. Nevertheless, he was absolutely supported by the athletic leadership and the team. Later he was - as we others also - criticized for the performance at the World Cup. The type of criticism was certainly not always at a good level - but then you have to go through as a player." Kroos was part of Germany's humiliating failure in Russia but the 2014 World Cup winner and 86-time international has no plans to walk away from the national team fold. "I will continue my international career. I will go on this path until the European Championship in 2020 and have set myself as a big goal, that we are significantly more successful there than last," the 28-year-old added. "Even before the World Cup - and especially afterwards - I thought about it and considered all sorts of decisions. And basically, regardless of success or failure in Russia. I feel that I need more rest than in the past five or six years to stay at the same level in the coming seasons. The past years have been extremely successful, but also very intense. And physically and mentally equally demanding. Often being away from home, that bothers me, I'm honest. "I had a very good conversation with Jogi Low, who understood my thoughts and explanations. And yet he fought to keep me alive. We will find solutions together so that I get a necessary rest here and there. This is the only way from my point of view and I am grateful to Jogi for his understanding. After all, everyone wants me to be in good shape by the summer of 2020. "My son Leon absolutely wanted me to continue playing for Germany. He is a big fan of Real and the national team. It would have been hard to say no."